What better way to end a great meal than to have some ice cream. I know it is technically Winter but seasons and living grain and sugar-free don’t stop me from having on of my favorite foods! If you reach for the stuff in the freezer section of the grocery, you will see a list of ingredients a mile long and words you don’t know how to say. I usually make my own ice cream so that I can keep the sugar and artificial sweeteners out. Don’t be afraid of unsweetened almond milk and coconut milk. You can make the ice cream with straight unsweetened almond and coconut milk if you are lactose intolerant, although the texture will not be as smooth. Unsweetened almond milk and coconut milk are also great tools in your arsenal for those trying to cut out the blood sugar spiking carbs. You can substitute other dairy for the almond and coconut milk but it will effect the carb count. Any way you make this ice cream, it is so much better than the stuff in the store! This is great for a small batch. When you snip the bag to squeeze out your culinary creation, it’s just like soft serve. It does melt fast, so be ready to eat! Want chocolate, add some unsweetened cocoa powder. Top with some nuts. Go crazy! 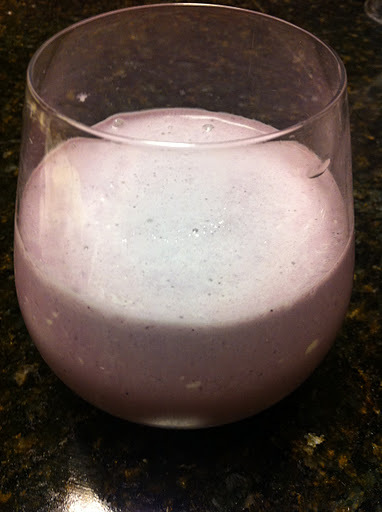 I made a blueberry milk shake by adding some of my homemade blueberry syrup to my glass! Mix ingredients well and pour into a quart size bag. Make sure it is sealed well. 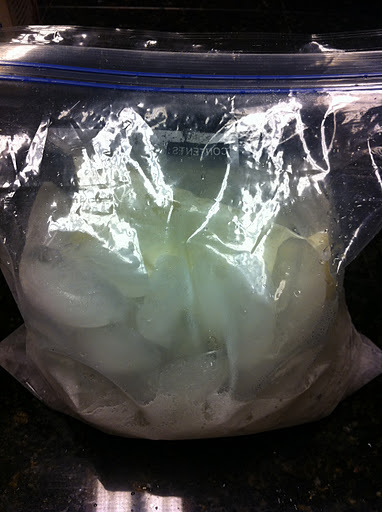 Place in gallon bag and fill with ice and rock salt. Seal gallon bag well. Shake or turn over, and over (and over), for about 5 minutes until ice cream thickens. Snip one end of quart bag and squeeze into serving dish like soft serve. 1/2 cup serving (using 1/2 and 1/2 or regular dairy milk in place of almond and coconut), around 10 carbs. 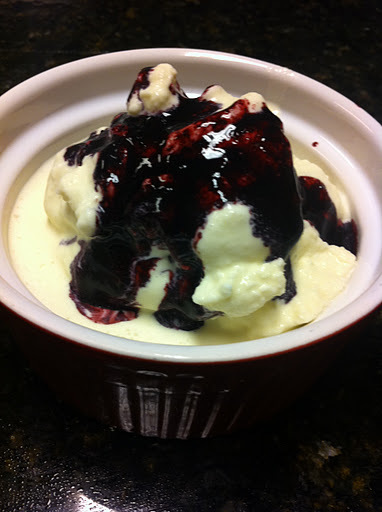 1/2 cup store bought no sugar, fat free vanilla ice cream: 19 carbs or more! I tried this tonight in my Vitamix blender and it came out kinda soupy. I don't think I used enough ice, but it had a pleasant taste to it. It was enough to kill that sugar craving! We made this tonight and it worked great and it was fun!! Thanks! @LindaG, glad you liked it, quick, easy and tasty! I Love this ice cream, it's better than any store-bought. And I love it with your chocolate chip cookies, oh, heaven! I make the cc-cookies and scoop them onto the cookie sheet. 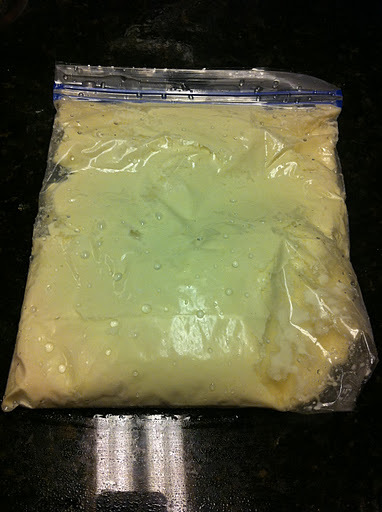 Then I prepare the ice cream and get it ready to turn in the bag. I put the cookies in the oven, then start turning the ice cream bag. Both are done about the same time, then you have warm from the oven cc-cookies to have with fresh cold vanilla ice cream–few things in life are better! Thanks for the photo with the plastic bag in the glass, that helps a lot in assembling the ice cream recipe! And thanks for all your wonderful recipes, Melissa!Please include a "tips" section in your cookbook. Also, you could next break your cookbook down, and sell separate cookbooks for "Deserts", "Main Dishes", "Dinners", "Breakfasts", etc. OMG – This is AMAZING! I can't believe how delicious the vanilla flavor is. I can't wait to try making other flavors. As soon as I have some of your recipes mastered, I will never buy bread or ice cream again! <3 I'm so grateful to you for blogging your recipes! Your site has been the first (that I've found) in a LONG time, that guides us plain and simple! I commend you! Having read the book Wheat Belly and making your recipes, I'm down 9.8lbs in 11 days! For anyone reading Melissa's blog and contemplating going wheat free & sugar free, DO IT. You will be feeling amazing (and NOT hungry) in no time! @Pearl, glad you are enjoying ice-cream and chocolate chip cookies! Isn't life grand!! 😉 @Karen, isn't it nice not to deprive yourself from ice-cream!? I haven't bought ice-cream in probably 2 years and I love that I can make it and know what is in it! So glad you are enjoying the blog and recipes and congrats again on your success!! Spread the word! @Jennifer, yes! 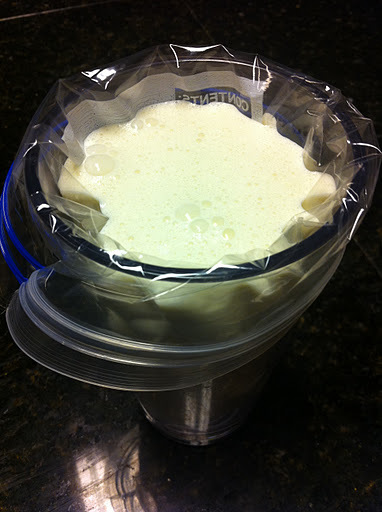 When I created this recipe I didn't have an ice-cream maker so the bag method did the trick. Now I have one just like you linked too! I love my ice-cream! Just made this for hubby. He rolled his eyes heavenward at the first bite! I brewed a bit of strong coffee in my mini french press and added it…his favorite flavor! No more Hagen Daz (sp?) You’re right about the sweetener…easy does it! I’ve been on several low carb, wheat free blogs and tried numerous recipes. Yours are rapidly becoming favorites. Yesterday I made your Fourth of July cupcakes and your salsa. So yummy! I’ve also made your pancakes and they are they best wheat free I’ve made, and I’ve tried a bunch! It’s very encouraging to have recipes that work when your trying to rework your menus and diet. Thank you for putting a good result out there. The pictures are so helpful! Makes me feel like I’m doing it right and you know these ingredients, while worth it, are more expensive than the junk stuff so waste is heartbreaking. I already have faith in your recipes! Thank you again. I know it can’t be easy with your two little ones! For me, I feel like I have a new hobby!! Learning to cook all over again and feeling great about it. Just discovered your site today and I am already printing out recipes and lists for my to-do’s this week. they all sound delicious and it is so encouraging to see that you can go grain free and be happy! thanks! Jo, you can get it at any supermarket and even Wal-mart. There is usually some either in bags or boxes on the spice isle. It’s just big chunks of salt. You could perhaps use regular salt but I would try to find the rock salt if you can. Hope this helps and I hope you enjoy the recipe! Do you use regular rock salt…the kind for snow and ice? Terry, I use rock salt made for ice cream makers.